Russia Focus, RBTH’s Korean-language supplement, makes its 2013 debut in the Joongang Ilbo newspaper on March 27. 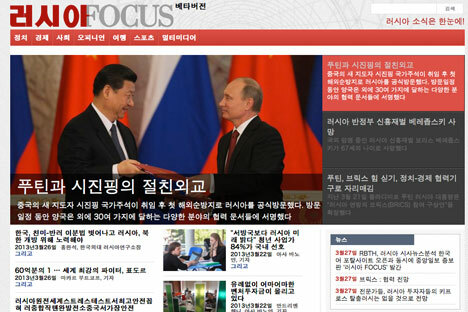 That same day RBTH’s Korean-language website, www.russiafocus.co.kr, is launched. Russia Focus has been published as an eight-page supplement in Joongang Ilbo, one of South Korea’s biggest newspapers (circulation: 1.3 million) since September 2012. The first issue of 2013 will focus on bilateral cooperation, the introduction of visa-free travel between Russia and South Korea and the story of the Korean short-track skater Ahn Hyun-soo, who obtained Russian citizenship to compete for the country’s Olympic team at the Winter Games in Sochi next year. All the materials from the printed supplement, as well as news, multimedia and infographics, will be available on the website www.russiafocus.co.kr. The editors welcome any feedback at editor@russiafocus.co.kr. A poll by Joongang Ilbo conducted in September 2012 found that over half its readers had seen or read the Russia Focus supplement.